I went back today and looked at our block lottery survey results from earlier in the year to see what we wanted to do but hadn't yet. There are several techniques such as applique that everyone would like to give a try so this fall we will be looking for volunteers that have experience to share their knowledge by doing demos at meetings. Several people requested a monochromatic palette...since we did colored monochromatic log cabins a year or so ago I decided to go obtain our palette this time with less color... light neutral solids such as whites, creams, taupes, tans and pale grays with a center accent in our blocks using a dark and muted neutrals such as charcoal, dark teals or navy (solids or small scale prints) but not so harsh as black. The completed improv blocks should be 12.5"... there is no pattern, just follow the inspiration of the mosaic above. 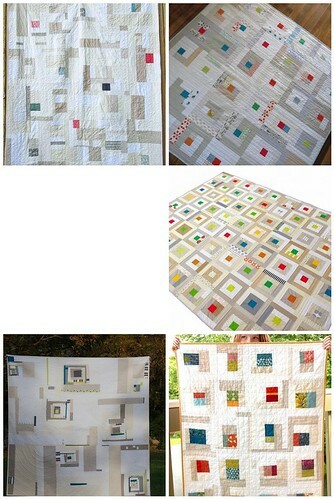 Photo number 3 by LeAnn is the best of example showing pieced blocks.